The Cold Chain is a process that ensures that vaccines, drugs, chemicals, etc. remain at the required temperature with the manufacturer, during transportation and at the Health Centre. The Cold Chain plays a vital role in the immunization programme. The WHO has laid down rigorous tests and procedures so that the Cold Chain Equipment withstands varied usage conditions including the rough and difficult terrain. GPC, an internationally name in the field of hospital equipment and devices, produces and exports various Cold Chain Equipments including Cold Chain Boxes, Vaccine Carriers and Vaccine Cold Boxes. The GPC Cold Chain Equipment strictly follows the WHO specifications and standards. 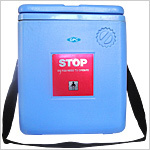 Our Cold Chain Boxes, Vaccine Carriers, etc. 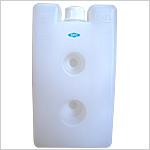 thus ensure high quality and complete safety. 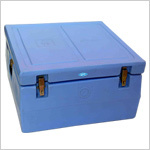 Send Your Buy Requirement For "Cold Chain Equipment" AND Get Quote Quickly.